PowerSwitch :: View topic - Are we on the brink of an electric car revolution? Are we on the brink of an electric car revolution? Posted: Thu Jul 02, 2015 9:43 am Post subject: Are we on the brink of an electric car revolution? Electric car sales have fallen far short of predictions, but the global push to cut carbon emissions and improved techology could see them poised to hit the mainstream, says Renault-Nissan�s head, Carlos Ghosn. The Nissan Leaf is a practical car for most people most of the time. It is still too expensive new, but second hand prices are so low as to make it an excellent second car in a family that needs two. The BMW i3 with range extender is pricier, but allows long journeys and is a good car who only need to travel long distance occasionally. There is a growing range of electric and plug in hybrids on the market. They may only be a tiny percentage of sales, but I think they will grow rapidly in demand once oil returns to $100. Prices still need to come down to get into the budget market that most people who would most benefit from their cheap running costs would be looking in. Until oil is too expensive, electrics will not win in an open market. When oil is too expensive, it will be too late to build the cars quickly enough. New technology is being tested by Highways England that could allow electric car owners to charge as they drive. The trials are the first of their kind and will test how the technology would work on the country's motorways and major A roads, allowing drivers of ultra-low emission vehicles to travel long distances without needing to stop and charge the car's battery. Let's do the numbers. A Nissan Leaf has real world range of 80 miles, dependant on driving style and speed. However, it will do for ballpark figures. If it is doing 70 mph on the motorway, it will exhaust its battery in just over an hour. The battery is 24KWh. To sustain the battery charge level the car must receive about 22KW of power continuously by electric induction. Induction chargers are a lot less than 100% efficient. If it was 90% efficient that is 2KWh of heat going into the car/driver/environment per car. On a motorway cars can travel at about 70M intervals (2 second separaion) or about 20 cars per mile/lane. Real world figures can be much higher. That put power requirement of 20 * 25 Kh = 0.5MW per mile/lane, or 1MW per mile for 2 lanes, one each way. UK has 2,200 miles of motorway, with a potential demand of 2.2GW. Of course these numbers are not real world, but they give an indication of the size of the infrastructure upgrade needed. I cannot find real world reports of inductive charging of moving road vehicles. article with some numbers for stationary vehicle inductive charging. I think this will be expensive , heavy equpment to add to a car, cutting into battery only range. It would need a lot of safety systems to avoid accidentally pumping 50KW into an unshielded car that strayed into the path of the beam. West Berkshire Green Exchange ran an EV event earlier this year, the EVent funnily enough, and had five manufacturers present. Apart from Nissan they were high end manufacturers. We couldn't get the small car dealers to come along as they're more interested in pushing their high efficiency petrol engined models. We're going to run it again next year as the Autoplaza dealership, which does all the small models, is now interested. We're running it in the pedestrianised High Street so should get quite good footfall rather than the out of town venue we used last time where we put about 200 people through one Saturday. China announced plans on Friday to build a nationwide charging-station network that will fulfil the power demands of 5 million electric vehicles by 2020. The network will cover residential areas, business districts, public space and inter-city highways, according to a guideline released by the State Council, China's cabinet. New residential complexes should build charging points or assign space for them, while public parking lots should have no less than 10 percent of parking spaces with charging facilities. I'm luke-warm on electric cars at best. For example the Tesla might do 356 Wh/mi. That's 1.3 megajoules of energy per mile. A litre of diesel has ~32 MJ and will get you some 11 miles, so 2.9 MJ per mile. Makes the electric look efficient? However, remember that to generate the 1.3 MJ of electricity from fossil fuels (and to distribute it) is less than 50% efficient taking the Tesla's 1.3 to at least 2.6 MJ... so same ballpark as the internal combustion engine. 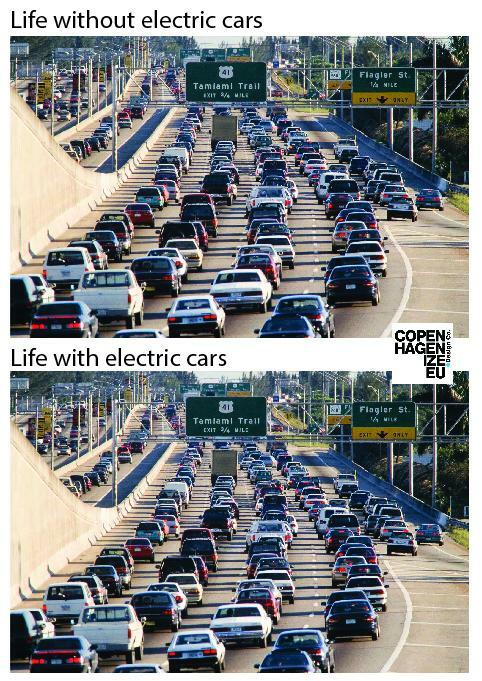 Electric cars aren't massively energy saving. They can use low carbon energy like nuclear, hydro, wind etc, which is good but it's not as if we are anywhere near running out of high carbon (coal, gas) electricity to displace such that we need to be looking to vehicles. Electric cars have clear benefits for local air quality. But I think they represent a real risk of locking us into another few decades of mass private ownership of big expensive boxes which spend 90% of their time sitting idle. The car is the problem more than its energy source. If CO2 is the aim - decarbonise existing grid and super insulate buildings (save gas heating) before looking at electric cars. If you live in a city then an electric car might be a good idea - but I argue far better public transport to mitigate the car itself would be better than swapping out oil for electric. And anyway that Tesla isn't going to appear for a couple of years and is still fabulously expensive. Just cheaper than the current version. It was interesting to see lots of car charging points around the streets of Amsterdam, mostly with electric cars tied to them. A well argued post based in objective science. A system of light weight, carbon fibre, automatic electric pods feeding into a trunk system of public transport would be the ideal. It would be nearer the convenience of the car but with much lower fuel and pollution costs. Travelling far less is a prerequisite as well. Travelling far less is a prerequisite as well. This is key. In my opinion, the top priority of the Department for Transport should be transport mitigation, figuring out how people can do what they need/want to do without travelling as much. Here's an area for some optimism because there is so much slack, so much opportunity in the system. Just in one sector for instance, think how much traffic reduction there would be if all children went to their nearest school and all teachers taught in their nearest school. With a bit of jiggling at the margins, that could be achieved with no ill-effect to educational outcomes. In my area, Lincolnshire County Council's second largest source of CO2 emissions after buildings is school transport. Back in the pre-Cambrian, or thereabouts, Fritz Schumacher in Small is Beautiful, talked of lorries full of biscuits passing each other in opposite directions on the road from London to Edinburgh. It's got a whole lot worse since. Under TTIP, buying local could be seen as a barrier to trade, thus possibly outlawed or at the very least, incurring a fine. It may seem fanciful but. While the both sides of that argument are quite sensible most teachers would have something to say about their side of things in the current atmosphere. It's a bit left wing authoritarian, Stalinist even!